Hands down the most durable, highest quality backlit gaming keyboard on earth. The Deck 105 key Legend: the last keyboard you will ever need. Rugged plastic housing with adjustable feet to give individual comfort. One LED per key lights the individual characters - and they will never rub off! The Deck 105 key Legend measures 18.5" long x 7" deep x 2" high (with feet raised) and weighs 3.5 pounds. And as always this Deck carries our 1 year warranty. White backlit, tactile keyboard. 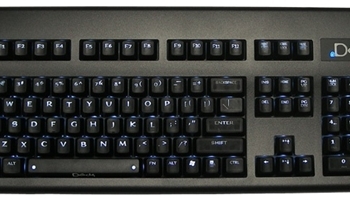 The Deck Legend keyboard is purchased with either a USB or PS/2 interface. Please read the applicable paragraphs. be purchased from 3rd party vendors if your PC has a 5 pin DIN receptacle. software drivers to be installed on the host computer prior to use. functions are not supported on numeric keypad keys. key down; it’s located just to the right of the spacebar. key, then press either “0” for “off”, or “1” – “7” for “on” brightness levels. LEDs dim along with the backlighting of the keys.